Determine the size of the spraying job. For lawns, measure the area to be sprayed. For trees, shrubs and flowers, apply as a thorough cover spray. Begin treating when insects first appear. Applications should be repeated only as directed to maintain control. Apply as directed. Remember, thorough coverage is important. Be sure to follow the important use limitations for the specific vegetable you are treating, including the amount of spray that can be applied, the interval between treatments and the days to wait before harvest. Remove safety tab from sprayer’s right side by pulling straight out. Discard or keep for future re-use. Spray until wet to control insects. Walk at a steady pace, working back toward the faucet while spraying using an even sweeping motion, slightly overlapping treated areas. Re-install safety tab into sprayer’s right side. With sprayer in the full “OFF” position, push tab into position. NOTE: This product is non-staining to most home siding depending on age and cleanliness. However, before using in areas where the spray may contact home siding (vinyl siding in particular), test in an inconspicuous area and recheck in a few hours. Do not use if any staining is observed. THATCH-INFESTING INSECTS/UNDERGROUND INSECTS including blue grass billbug (adult), black turfgrass Ataenius (adult), chiggers, chinch bugs, white grubs (Japanese beetle, European chafer, southern chafer), dung beetle and hyperodes weevils (adult) and mole crickets (nymphs and young adults). 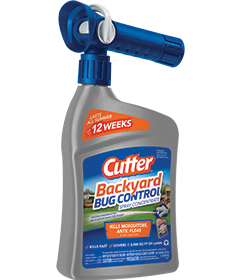 Use 1 qt of Cutter® Backyard™ Bug Control Spray Concentrate to treat 2,500 sq ft of lawn. For sub-surface insect control (mole crickets, grubs), water treated area with additional ¼ to ½ inch of water for optimum results. Do not apply more than seven times per year per location. SURFACE INSECTS including ants*, armyworms, cockroaches, crickets¥, cutwormsβ, earwigs, fleas, ladybeetles****, lawn moths (sod webworms), millipedes, mosquitoes, moths∞, palmetto bugs, sowbugs, mites^, spittlebugs, lone star ticks, brown dog ticks, American dog ticks, deer ticks (which may transmit Lyme Disease) and waterbugs. Use 1 qt of Cutter Backyard Bug Control Spray Concentrate to treat 5,120 sq ft of lawn. Thoroughly wet down grass a few hours before applying. Delay additional watering or mowing for 24 hours after application for optimum control of surface insects. Do not apply more than 14 times per year per location. WHEN TO TREAT: Treat the following pests during the months indicated or when first noticed. Treat ants* and other insects when they first appear or you notice lawn damage. OUTDOOR SURFACES USE: For control of ants*, centipedes, cockroaches, crickets, fleas, kudzu bugs, millipedes, mosquitoes, palmetto bugs, scorpions, sowbugs, pillbugs, spiders, stink bugs, deer ticks and waterbugs. Apply as a residual treatment to ornamental plants next to foundations of buildings and to surfaces of buildings, porches, screens, window frames, eaves, patios, garages and other similar areas where these pests are active. One quart of Cutter Backyard Bug Control Spray Concentrate treats 2,100 sq ft. Repeat application every eight weeks for control of house crickets, carpenter ants and harvester ants. For use on ornamental trees, shrubs and flowers such as but not limited to: Ageratum, Aster, Arborvitae, Arizona Cypress, Azaleas, Begonia, Birch, Boxwood, Box Elder, Camellias, Carnations, Cherry (ornamental), Chrysanthemums, Carnations, Coleus, Common Ninebark, Conifers, Douglas Fir, Elm, English Ivy, Euonymus, Exacum, Weeping Fig, Fir, Gladioli, Gold Bells, Hawthorn, Holly, Honeysuckle, Hypoestes, Ivy, Juniper, Lilac, Locust, Maple, Marigold, Mimosa, Mock Orange, Nannyberry, Oak, Orchid, Palm, Pansy, Pea Shrub, Petunia, Philodendron, Pine, Ornamental Plum, Poinsettia, Poplar, Tulip Poplar, Rhododendron, Roses, Snapdragon, Snowberry, Spruce, Taxus, Weeping Fig, Willow, Zinnia. To control ants*, armyworms, azalea caterpillar, aphids***, bagworms, black vine weevil (adult), boxelder bugs, budworms, California oakworm, cankerworms, cicadas, cockroaches, crickets¥, cutwormsβ, Eastern tent caterpillar, elm leaf beetles, European sawfly, fall webworm, flea beetles, forest tent caterpillar, gypsy moth larvae, Japanese beetles (adults), June beetles (adults), lace bugs, ladybeetles****, leaf-feeding caterpillars, leafhoppers§, leafminers+ (adults), leafrollers#, leaf skeletonizers, kudzu bugs, midges, moths∞, oleander moth larvae, pillbug, pine sawfly, pine shoot beetles, pinetip moths, plant bugs, root weevil, sawfly, scale insects (crawlers), spiders, spittlebugs, stink bugs, striped beetles, striped oakworm, thrips, tip moth, tussock moth larvae, broadmites, brown softscale, California redscale (crawler), clover mites, mealybugs, pineneedle scale (crawler), spider mites and whiteflies. Apply as a thorough foliar spray. Wet leaves and branches to the dripping point. Try to spray underside of leaves and penetrate dense foliage. For best results, apply early before insect populations are high. For scale control, treat entire plant, including stem, trunks and twigs. For bagworm control, apply when bagworm larvae begin to hatch. Storage: Store in a cool dry area away from heat or open flame. CAUTION. Harmful if swallowed. Causes moderate eye irritation. Avoid contact with eyes or clothing. Wash hands thoroughly with soap and water after handling and before eating, drinking, chewing gum, or using tobacco. Have the product container or label with you when calling a Poison Control Center or doctor for treatment advice. This product is extremely toxic to fish and other aquatic organisms. Drift and runoff from treated areas may be hazardous to aquatic organisms in neighboring areas. To protect the environment, do not allow pesticide to enter or run off into storm drains, drainage ditches, gutters or surface waters. Applying this product in calm weather when rain is not predicted for the next 24 hours will help to ensure that wind or rain does not blow or wash pesticide off the treatment area. Rinsing application equipment over the treated area will help avoid runoff to water bodies or drainage systems. This product is highly toxic to bees exposed to direct treatment or residues on blooming crops or weeds. Do not apply this product or allow it to drift to blooming crops or weeds if bees are visiting the treatment area.